Our guest today is Dr. Matt Johnson, another colleague who works with Ken and Dawn at IHMC. Matt is a research scientist who joined the institute in 2002 after a 20-year career as Naval aviator. He focuses on human-machine teaming as it relates to technologies such as robotics, software agents and autonomous vehicles. These technologies are used in military responses and help first responders with disaster responses. They are used in space and aviation work as well. He also is part of an IHMC team developing humanoid behaviors and advanced interface concepts that will enable Boston Dynamics’ Atlas robot and NASA’s Valkyrie robot to do complex work. Matt was in the news recently for a project he’s doing with the police department here in Pensacola. He’s leading a team to develop specialized drones that police officers will be able to use in a number of areas ranging from search and rescue operations to disaster response. AI Magazineis running an article in its spring issue that Matt co-wrote with Alonso H. Vera, the chief of the Human Systems Integration Division at NASA Ames Research Center. Titled,“No AI Is An Island: The Case For Teaming Intelligence,”the article argues that artificial intelligence will only reach its full potential if it has enough teaming intelligence to work well with humans. [00:02:52] Matt begins by discussing his upbringing in Long Island, New York, and his unusual family dynamics. [00:03:25] Dawn asks what lead Matt to attend the University of Notre Dame in Indiana and work on undergraduate degree in aerospace engineering. [00:03:59] Ken brings up that after obtaining his undergraduate degree, Matt went into the Navy as an aviator, and asks what motivated that transition. [00:04:44] Matt explains how he ended up at Texas A&M in Corpus Christi where he obtained his master’s degree in computer science. [00:05:45] Matt talks about his transition out of the Navy and how he came to live in Pensacola and work at IHMC. [00:07:02] Matt touches on how after a few years at IHMC, he began working on his Ph.D. through Delft University in the Netherlands. [00:10:03] Ken mentions that Matt’s research focuses on making technology more flexible and resilient through human-machine teamwork. He asks Matt to define what he means by human-machine teamwork. [00:11:51] Dawn brings up that Matt’s human-machine teamwork endeavors have led to a number of different projects in various fields, one of which is a partnership with the Pensacola Police Department to develop specialized drones for police use in a number of operations including search and rescue and disaster response. 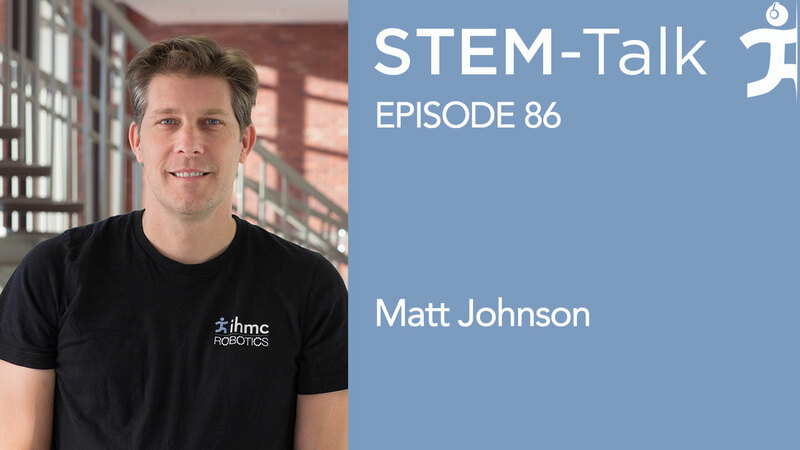 [00:14:05] Matt discusses his ongoing project to help develop humanoid behaviors and advanced interface concepts for robots. [00:15:53] Ken asks Matt to talk about an article Matt has with Alonso Vera of NASA Ames that’s appearing in the spring issue of AI Magazine. [00:17:03] Dawn talks about how machine intelligence is making inroads into our everyday world, citing a few examples such as self-driving cars and digital assistants like Siri and Alexa. Dawn asks Matt if he can use self-driving cars as a way to explain the gaps and challenges that intelligent technologies still face. [00:18:52] Matt talks about how humans are still far better at driving cars and that the technology for self-driving cars still has a long way to go before matching the safety record of humans. [00:20:11] Dawn describes how Elon Musk told a group of governors that they should adopt AI legislation before robots go rouge and start roaming the streets killing people. She asks Matt if he agrees with Musk, or if the notion of rouge robots is an over exaggeration. [00:21:23] Ken mentions that it seems natural to think of AI, and technology in general, as a means to compensate for human limitations. He goes on to mention that Matt’s article in AI Magazine warns people to be aware of misconceptions associated with this viewpoint, and asks Matt to talk about them. [00:25:47] Ken asks what “common ground” means in regards to the communication between humans and AI, given that “common ground” has a technical meaning in communication theory and is generally mentioned in regards to intelligent human beings who share an understanding or mental model of the world. [00:27:14] Ken asks Matt for his takeaways from the book “Digital Apollo” by David Mindell, which described tensions that existed between the engineers and astronauts during the Apollo years. [00:28:43] Dawn mentions that Matt was recently awarded a grant to work with on a NASA-related project to use machine-learning to optimize signal capture on a novel device being developed at CalTech lymphatic imaging. [00:29:08] Ken asks Matt what he does in his downtime. [00:29:34] Dawn asks Matt about his frequent humanitarian trips to Hatti, which he has been making over the past several years as a volunteer at an orphanage and adjacent medical clinic.